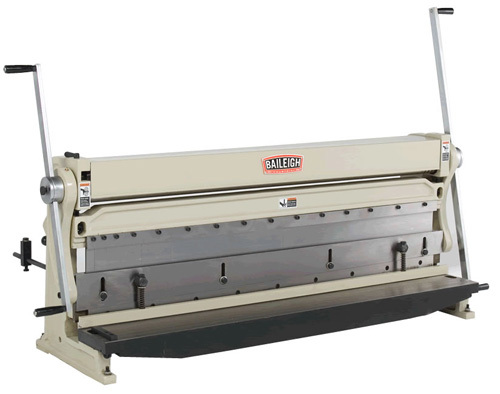 The SBR-5220 manual press brake and shear also has a slip roll feature making this machine a combination 3-in-1 shear brake roll. This model has an ample 52 inch width that allows for 48 inch wide sheets of sheet metal up to 20 gauge mild steel and 16 gauge aluminum. The manual press brake has a hardened single-vee bottom die and the upper beam as removable and movable hardened finger dies. The movable fingers are in varying widths so the operator can move them around to make boxes and pans in varying sizes. The manual metal shear can cut 20 gauge mild steel across the entire width of the machine. The bottom and top shear blades are hardened and reversible for long life. The manual slip roll has hardened bottom and top roll and there are also three wire groove to roll round rod.